Eight pomegranates later I’m glad to report that making pomegranate extract in the home kitchen is possible and the product can be used in a variety ways. Whether or not it has health benefits would need to be determined by clinical trials and chemical analysis and/or by the individual user at their own risk. But someone needs to be patient number one and being a professionally trained quantity foods and individual diet planner and producer helped give me the knowledge base I needed to turn the animal based research into a home kitchen recipe. Background info – “an extract” of a food could be considered in Master Chef terms as either a raw, fresh squeezed juice or as a heated/simmered tea or soup stock. Tea: A tea is generally made from dried herbs or dried fruit or flowers and is usually steeped for about 15-20 minutes for herbal tea or for one and half to four or five minutes for a green tea or black tea. Over steeping tea leaves can release an excess amount of the more bitter tannins which can have negative health effects of blood clotting for some people, (more on tannins in different types of tea: livestrong.com), and less healthy oxalic acid which can be a problem for people with kidney stones. (Rooibus, red tea, does not have oxalic acid. (beliefnet.com)) (Cold brewing (tching.com) may release less tannin content; although some tannins can have health benefits and some people get used to stronger more bitter black tea. 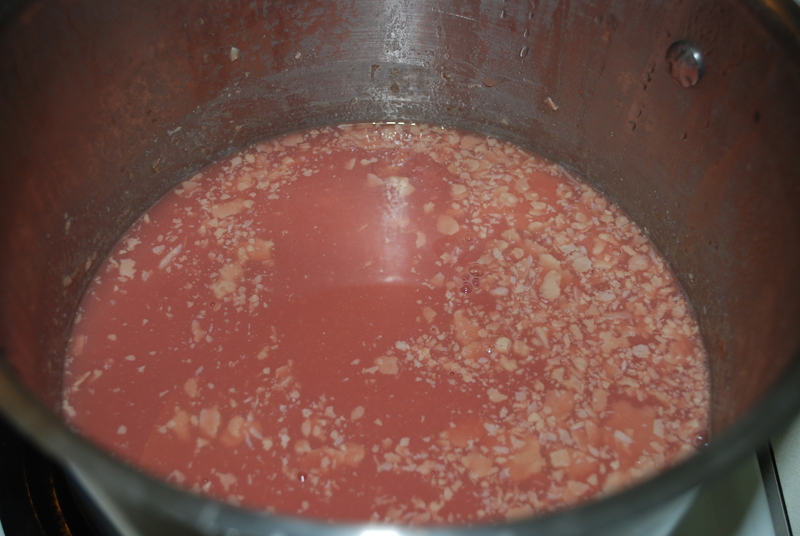 Soup stock: Soup stock may be made from washed and trimmed parts of vegetables that are not being used or are too fibrous for use in a food being prepared for direct consumption. A bone stock is simmered or roasted for a couple hours to release as much nutrient content as possible from the bone marrow (inner part of the bones) and cartilage and other trim that isn’t pure fats. A vegetable stock is simmered for less time as the nutrients from vegetables are released in a shorter amount of time, twenty to thirty minutes usually is adequate to release full flavor without destroying nutrients and flavor from over heating. Juice: A good quality juicer is needed which the average home kitchen typically does not have. And a juicer can only handle soft fruits or vegetables of a consistent quality, carrots are generally possible but tougher seeds or peels need to be removed from other vegetables or fruits. Orange peel can not be juiced and would likely taste too bitter for making a quantity of juice. I use a sprinkle, 1/8 th teaspoon of minced dried lemon peel in soup which I add at the table rather than to the soup pot to retain more of the aroma and redcue risk of break down of the flavor or phytonutrients during the cooktime of a soup. 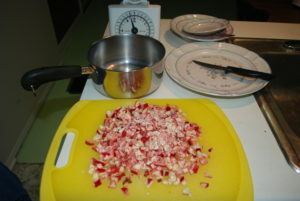 Pomegranate peel is very tough and is fairly dry. The soft whitish inner membrane could be run through a juicer but the brilliantly colored reddish peel also likely contains healthy phytonutrients and makes up more of the volume of the trim leftover after removing the juicy seeds. Research on pumpkin seed kernels revealed that toasting them increases phospholipid content and that is a nutrient that can have health benefits for promoting Nrf2 and other health promoting needs for the body. 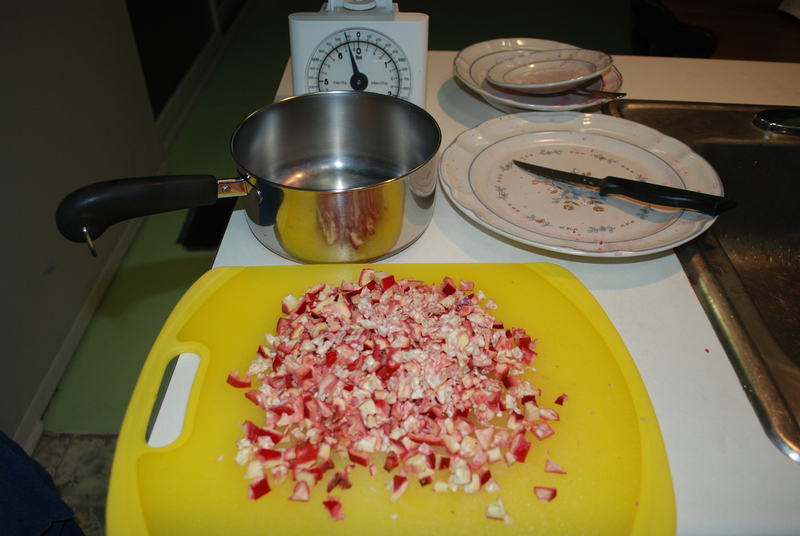 So my kitchen trials focused on making a soup stock type of pomegranate peel/membrane extract. 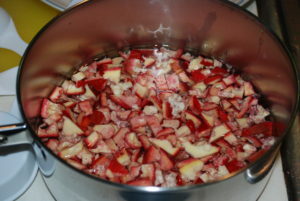 I tried batches simmered for 20 minutes which retained more color and for 30 minutes which broke down more of the pulp and resulted in a thicker, creamier extract. Both products seem to help my health symptoms and improve my energy level and mood. The fruit is likely coated in a food grade wax to help it remain fresh longer. Washing the outer surface before cutting is a good idea, I just rinsed mine rather than using any special produce washing chemical. (Example of a product designed to remove food grade waxes. TraderJoe’s Fruit and Vegetable Wash) Glyphosate may be a chemical that is actually taken up into the produce or animal product so washing the exterior would not remove hypothetical risk from produce grown with it. (The chemical, glyphosate,is very similar to an amino acid, glycine, and it may be incorporated directly into protein structures in place of molecules of glycine, hypothetically. 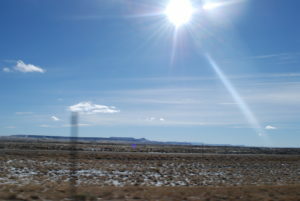 This theory needs more research; which wouldn’t be difficult for professional chemists with access to radioactive marking chemicals – radioactive label the glyposate; grow the product with the standard application rate of glyphosate/Roundup; and then test the produce, or animals that were fed with the produce, for presence of the radioactively labeled glyphosate – not a task for the home kitchen chef). If a larger quantity of pomegranates are available to make a big batch of extract then any excess seeds that won’t be able to be used fresh can simply be put in a freezer bag or container and frozen for later thawing to use fresh on salad or as a snack or dessert fruit. I rinsed the seeds before freezing to remove any residue left from the occasional bad/rotten seeds. The pomegranate tips I read suggested a simple method to trim many pomegranates was to score the rind in half and then sixths or eighths; and fill a clean sink or large container with water and remove the seeds under water. Good seeds tend to be heavy and sink and bad seeds and the membrane and rind tend to float. Skim off the top layer of floating seeds and membrane and separate and trim the good parts of the inner membrane and rind and discard any decayed rind or seeds. Drain the bowl or sink and remove the seeds and sort for any bits of membrane. I didn’t try this method. I sorted god and bad seeds into separate bowls and trimmed the pile of peel/membrane of discolored areas afterward. Using food safe gloves might help protect the skin if prepping a large batch. The juice is acidic and can be a little drying to the skin. Put the seeds in a refrigerator container to use fresh or a freezer container to store for later use. I chopped the trimmed peel and inner membrane into roughly a quarter inch dice to try to maximize how much phospholipid and other phytonutrients might be released during the simmering phase. The extract might be as potent with a larger chop or no extra chopping. I didn’t experiment with that aspect – all batches were made with a quarter inch dice. Bring the peel/water/coconut oil mixture to a simmer at medium high heat ( a few minutes) and promptly turn down the heat to medium or low, cover with a lid, and continue at a gentle simmer (barely bubbling) for 20-30 minutes. Try not to overheat which might be noticed as a caramelized sugary smell or membrane fiber sticking to the bottom of the pan. Stirring occasionally can help. Use the extract fresh or freeze the excess. It is quite acidic and fairly concentrated. To drink it as a juice I diluted with water, doubling roughly the volume and adding an ounce of 100% cherry juice and a spoonful of sugar helped the flavor, but pH strips and my stomach told me the acidity is the main issue with making it tolerable to drink. It is more acidic than coffee. I started adding baking soda as I do to my coffee but instead of one pinch per cup of coffee I ended up needing four pinches to get the pH adjusted to around a 6.0 it started at 4 or less (water is ~ a 7.0) (I happened to have pH strips on hand). My health symptoms seem to be more stable with the addition of extract to my diet than they were with the 1/3 to 2/3 cup of pomegranate seeds each day. The other advantage is that freezing extract and seeds could help make it easier to have a reliable year round source for something that is needed for a daily health need. The unchopped peel in the scale, a large bowl of good seeds and a small bowl of a few discolored seeds. This pomegranate didn’t really have many bad spots. The chopped, 1/4 inch dice, raw peel and inner membrane. The raw chopped peel and water before heating. A large batch of the extract with peel and membrane after cooking 30 minutes. 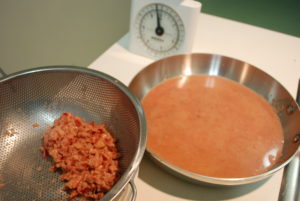 A pan with drained extract and a colander with the leftover larger peel – this batch was cooked for 20 minutes. 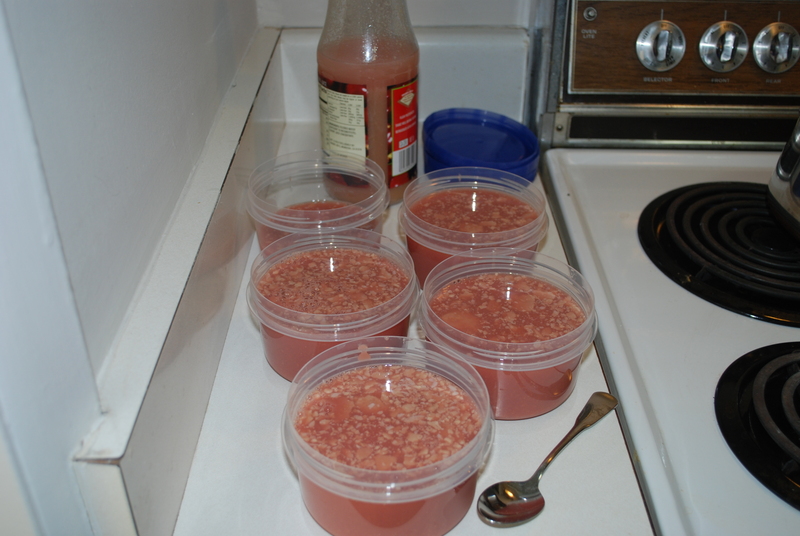 A little chilled coconut oil is floating on top of the containers prepped to freeze. The large pomegranate averaged more seeds but the total peel/membrane ended up being only a little more than from the small size. However the small ones I had were fresher and had fewer bad spots to trim so less waste may have been the major difference. 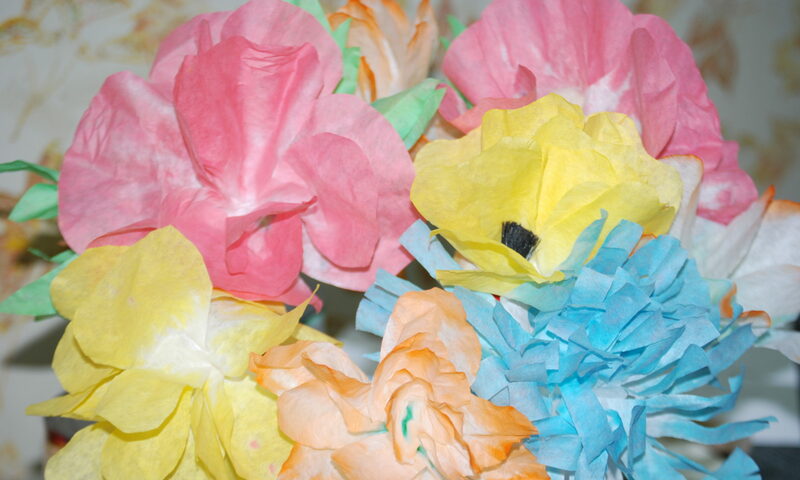 The size difference isn’t type, it depends on when the blossom was pollinated. The pomegranate can have a few blossom setting times during the spring and blossoms that pollinate early produce large fruit and later ones produce smaller fruit. Or a shorter or drier growing season or less fertilizer applied to the rows may also result in smaller fruit. Pomegranate are usually sold by unit price rather than by pound so a larger fruit averaged about twice the size of the small size and would be a better deal if the price was per unit/ per fruit rather than by weight. 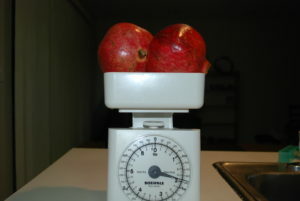 The large fruit, (six), averaged 18 1/4 ounces, 510 grams. And provided an average of 11 1/4 ounces, 306 grams, good seeds, and 7 ounces good peel/membrane, 195 grams, and 3 1/4 ounces bad seed/peel, 106 grams. 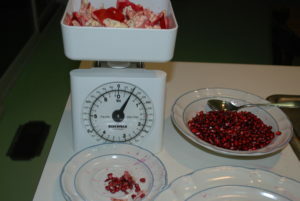 The small fruit, (two), averaged 9 3/4 ounces, 270 grams. And provided an average of 4 ounces good seeds, 110 grams, and 4 3/4 ounces good peel/membrane, 123 grams, and 1/4 ounce bad seed/peel, 6 grams. The total extract made depended on how much water I used and the concentration varied so it would be difficult to give any accurate yield but roughly the amount of water used resulted in a similar amount of extract produced. Each pomegranate roughly produced two to three cups of concentrated extract which needs to be diluted with another two t three cups of water or soup to be palatable.